The fern, which is eaten as an appetizer in Russia east of the Urals, is very rarely eaten in the European part of the country – and this is just one of its mysteries. The Feast of St. John the Baptist was a very popular holiday among Russia peasants in Siberia. 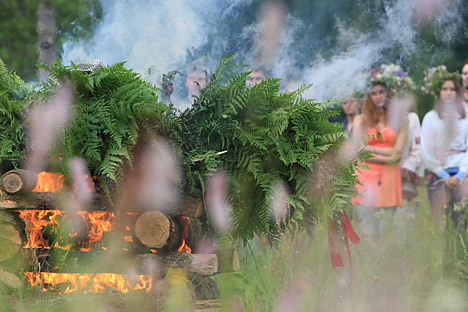 On the eve of Ivan Kupala Day, as Russians call it, the people danced a dance called the khorovod, jumped over bonfires, and performed fertility rites. Ferns played a part in one of the most mysterious rites. According to legend, on this holiday the fern, which usually does not bloom, but reproduces with spores, would produce just for a moment a magical flower that burned with a bright scarlet light, and whoever picked it would be able to see buried treasures, no matter how deep they were. This lucky person would acquire other magical powers as well, such as the power to become invisible, and being able to escape from any jail with ease. But picking the flower was a challenge because of the evil spirits that vigilantly guarded it. But the importance of ferns in the Russian peasant diet was not limited to festivals. Young fern shoots (those less than 10 inches long whose leaves have not opened yet), which can be gathered from ravines, vacant lots and at the edge of forests and at the damp edge of a forest are surprisingly tasty either salted or pickled – in the same way that seaweed is eaten in Japan. Fern is commonly eaten in Siberia and the Far East, but in European Russia it is almost never has a place on the table. The reason for this is not entirely clear. Fresh fern is poisonous, but the fear of being poisoned has ever stopped Russians from consuming numerous types of poisonous mushrooms after soaking and cooking them to remove the toxins. For those living in Siberia and the Far East, fern is not only a delicacy, but a valuable export. Hundreds of tons of it are exported to Japan. To prepare the ferns for export, shoots are harvested and salted three times. Apparently, the Siberians learned from Asians how to eat the fern, which when properly prepared is actually very healthy. It often grows in iodine-rich soil, and this element is found in the plant in a very easily digestible form. Dieticians recommend that people who are at risk of radiation exposure should eat fern. Russians don't prepare ferns in the Eastern style, but according to their own customs. They use them as filling in traditional small pies (pirozhki). Steamed or salted fern is washed and then the water is squeezed out. Then the fern is mixed with chopped boiled egg, chopped onion, pepper, and butter. The mixture is used as a stuffing for piroshki made from yeast dough and baked in a Russian stove or conventional oven. With a glass of ice-cold vodka this snack is just as good as and other classic Russian appetizers and also helps to decontaminate the body.